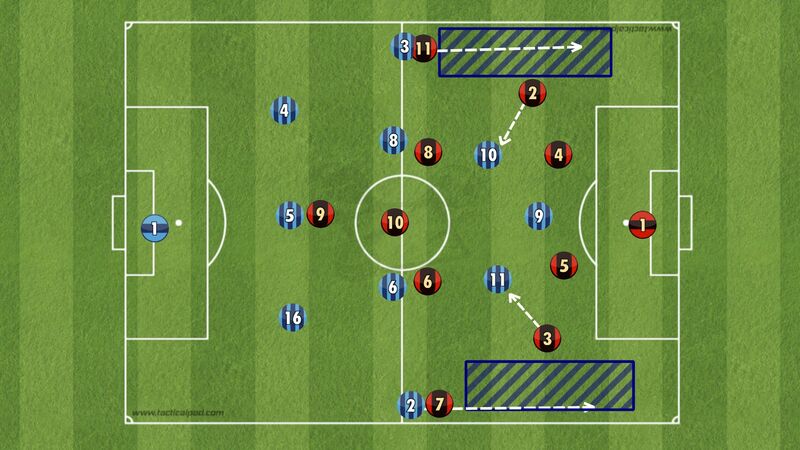 Youssef Amin tactically lays out the merits and demerits of the two commonly used three-man defence formations. Three at the back formations have largely become the trend in football right now with many successful teams using them, most notably Antonio Conte’s Chelsea. This article will analyse why they are so successful and will discuss potential weaknesses. The most obvious advantage of three-man defences are the fluidity they offer: a team can defend with five and the wing backs can then easily turn into wingers when they get the ball. This can create overloads in many areas of the pitch and in turn free up half spaces. 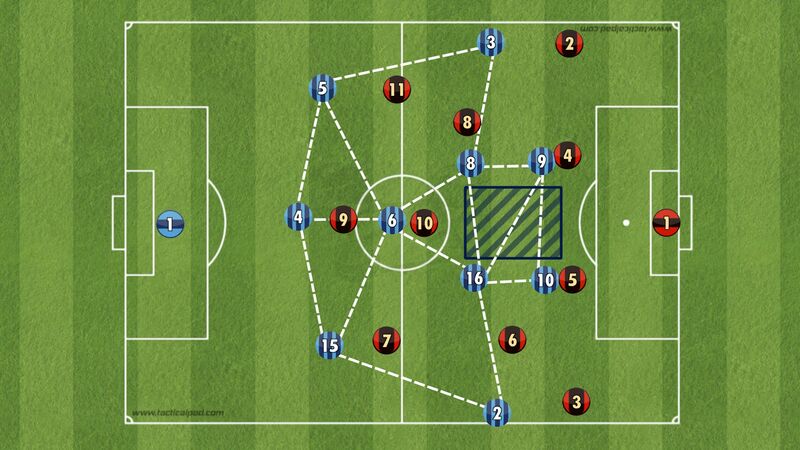 These formations are also very hard to break down as the teams tend to defend in a deep compact shape which minimizes the space the opposition has. With most formations this era containing one striker, three at the back formations almost always render him useless due to the striker being outnumbered. The 3-5-2 is a very basic formation which can be very effective if used correctly. It requires two tireless wing backs that can go up and down the pitch easily without tiring in order to provide support in the attack and drop back in as full backs when the opposition has the ball. The three central midfielders work as a single unit with the deepest one usually a playmaker dropping deep while the other two support the attack. The two strikers are usually very strong and adept at holding the ball up as they are normally very isolated if their team is under pressure. Another variation of this formation is the 3-5-1-1 which Conte is experimenting with for Chelsea now but it is very hard to master and Chelsea should end up reverting back to the 3-4-3. Three at the back systems are favoured for their fluidity and the different tactical options they provide. When the team has the ball both wing backs get forward to provide the width and centre backs push up to compress the other team which pushes them deeper and gives more space for the midfielders to work in. As you can see from the diagram a team playing the 3-5-2 correctly would create lots of positive triangles and they would always have the extra man in midfield. 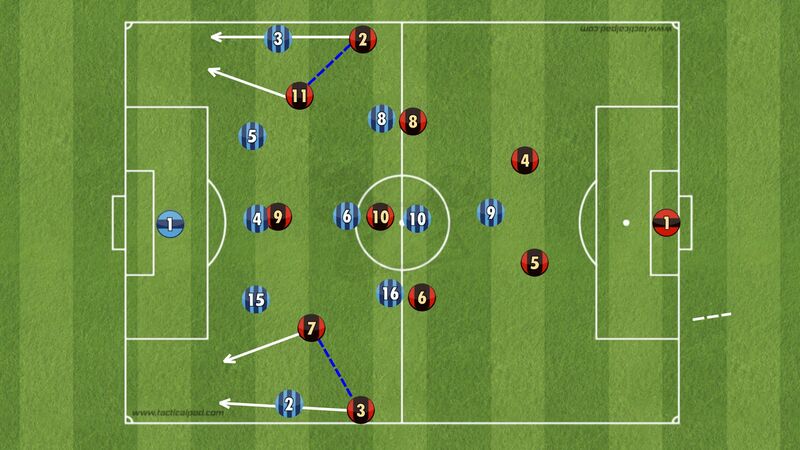 This enables the team to keep the ball and create more space on the wings for the wingbacks to exploit. Alternatively a team that diagonally passes the ball quickly with little or no build up would draw the opposition towards them and open up more half spaces in the midfield which they can exploit. The diagram above shows an example of that and the half space shaded in blue is in a very dangerous position which could lead to goal scoring opportunities. Another advantage of the 3-5-2 is the defensive solidity it offers. Teams that play the 3-5-2 can be very solid and compact and extremely hard to break down. The diagram above shows the basic defensive shape of a team playing with a 3-5-2 and as you can see the defenders are very deep and the midfielders are almost on a straight line. One of the strikers drops deeper and the other is in wait of the counter attack. The diagram shows how effective the 3-5-2 is if you choose a basic man marking system. Every opposition player is marked and the half spaces free are limited. This can be very effective if you are a possession based team who press high up the pitch as it will lead to a numerical advantage and once again nullifying the opponents threat. The 3-5-2 is not the perfect formation; as is the case with every tactical system in football, there are some weaknesses which can be exploited. The space highlighted is the biggest weakness of the 3-5-2 formation. 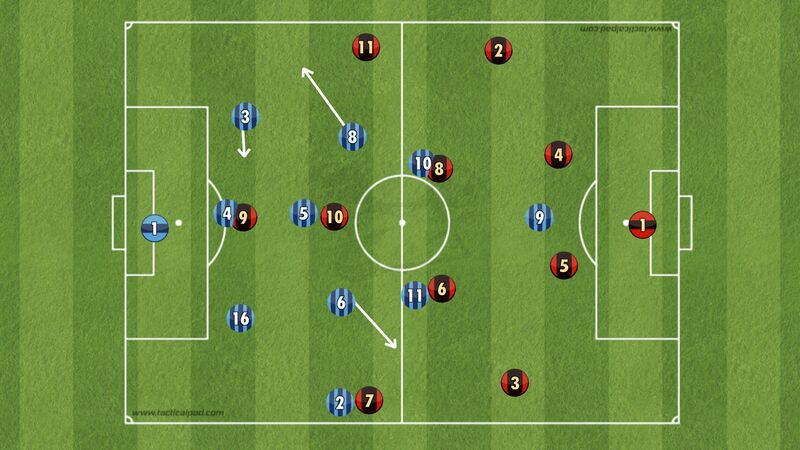 The half spaces between the wide centre backs and the wing backs can cause catastrophes if exploited. A tricky winger or a technically gifted inside forward can thrive in the half space if not protected successfully and could cause overloads down the wings. The diagram shows an example of a winger and a full back combining to cause an overload down the wing and exploit the aforementioned half space. A team that can use this tactic successfully numerous times will eventually draw the opposition out of position and ruin the structure of the 3-5-2. A midfielder or a centre back will be forced to track the winger which as a result will open up more space in the middle. The 3-5-2 is a formation that can be deadly or disastrous depending on how well drilled a team is in using it. 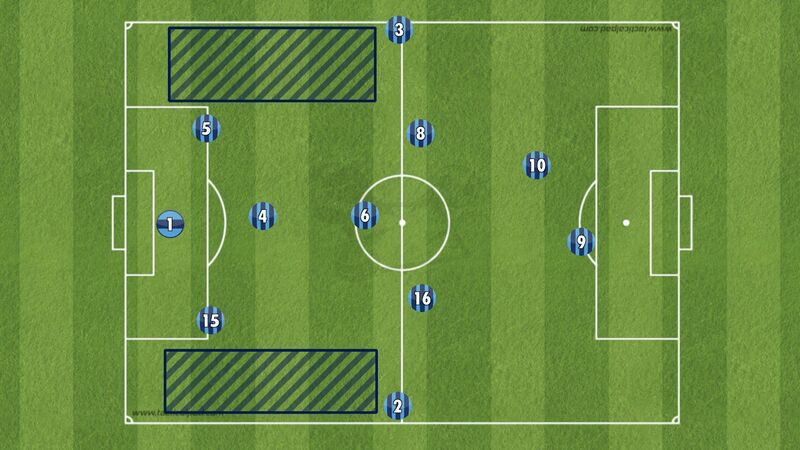 Every single player needs to understand their role perfectly in order to pull of this formation successfully. The 3-4-3 is the trendiest formation in football right now due to the success achieved by Chelsea while using this formation. Many teams have followed this trend due to the many positives a 3-4-3 can provide on the pitch. It allows the front three, the two faux number 9s and the proper striker lots of creative freedom and it helps them wreak havoc. To execute this system you need two defensive minded midfielders with good passing skills to supply the ball to the front three and prevent them from being isolated. The central centre back is usually a ball playing defender with superb technical ability and someone who is able to hit long diagonal passes towards the wingbacks (David Luiz for Chelsea). 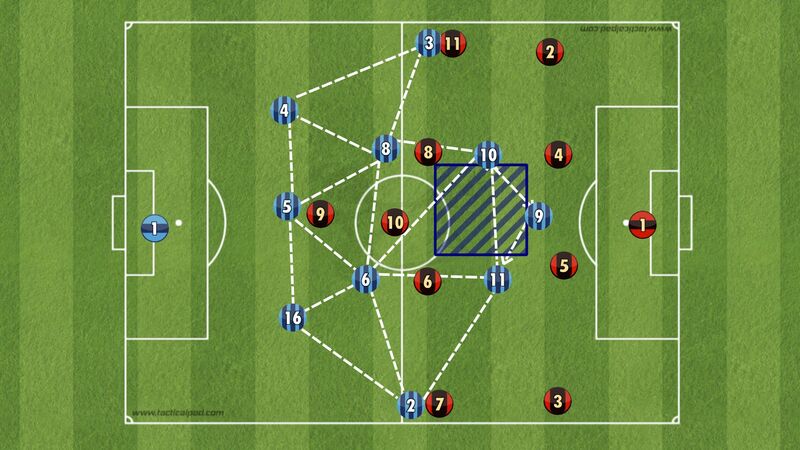 The 3-4-3 if executed correctly is arguably the best formation attacking wise in football. The wing backs keep the width and the three forwards interchange to confuse the opposition and aim to get the ball in the half space between the opposition midfield and defence where they can be most effective. The diagram above shows how the players are linked in the 3-4-3 and how the formation creates passing triangles where the player who has the ball has at least three options to pass the ball too. As mentioned before, the 3-4-3 aims to exploit the half space in between the midfield and the defence where the two number 10s can roam where they would not be picked up. The midfielders would be too preoccupied with the two defensive midfielders and the centre backs will be picking up the striker. 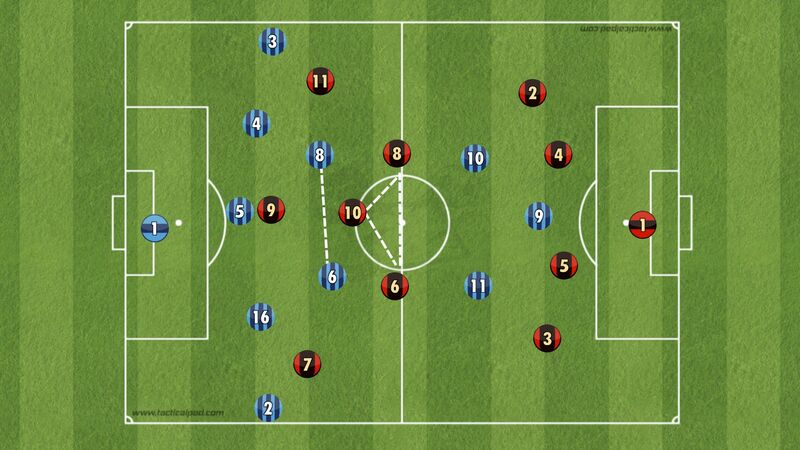 This is why the 3-4-3 can be so effective against teams that play a variation of a four at the back formation. Alternatively, the fullbacks could try and mark the inside forwards which would then leave lots of space for the wing backs to run into. This can be very effective especially on the counter attack. The team can create an overload down the wing and hit the opposition quickly, something Chelsea did many times last season. As the diagram above shows the 3-4-3 is very effective in stopping a team playing with a 4-4-2. The two strikers would be picked up by the two centre backs and the sweeper would be left to step into the midfield while the two midfielders go wide and deal with the full back if they advance. The two inside forwards can deal with the opposition midfielders. Dealing with the 4-2-3-1 would be similar instead though the sweeper would have to come out towards the number 10 while the full back covers and the left sided centre backs tucks inside; this requires the midfielder to cover for the wing back. The 3-4-3 is very compact in defence and is similar to the 3-4-3 in defensive terms but it is far more effective on the counter due to the extra man in the attack. Most teams who use this formation prefer to drop deep and keep their shape similar to Conte’s Chelsea aiming to use the pace to hit teams on the counter quickly. The 3-4-3 can be very vulnerable defensively if the team do not work as one unit. 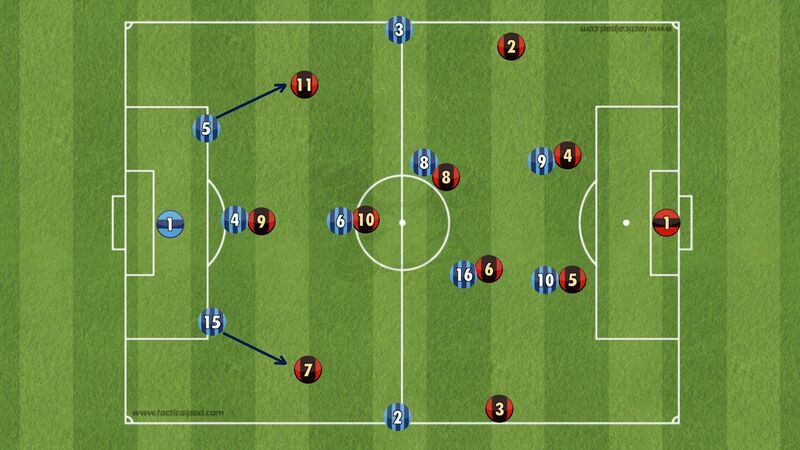 Most of the defensive problems this formation faces is due to the number 10s not tracking back. Most creative players lack work ethic which can leave teams exposed to overloads in the centre of the pitch, which is why managers tend to use hard working number 10s who tracks back (Pedro) and another in the trequartista role who has little or no defensive duties (Hazard). In the diagram above you can see the team is outnumbered by the opposition due to the two attacking midfielders not tracking back. In this situation the three defenders are rendered useless because they are only marking one player. This leads to confusion as the defenders don’t know whether to mark the extra midfielder or stay put. 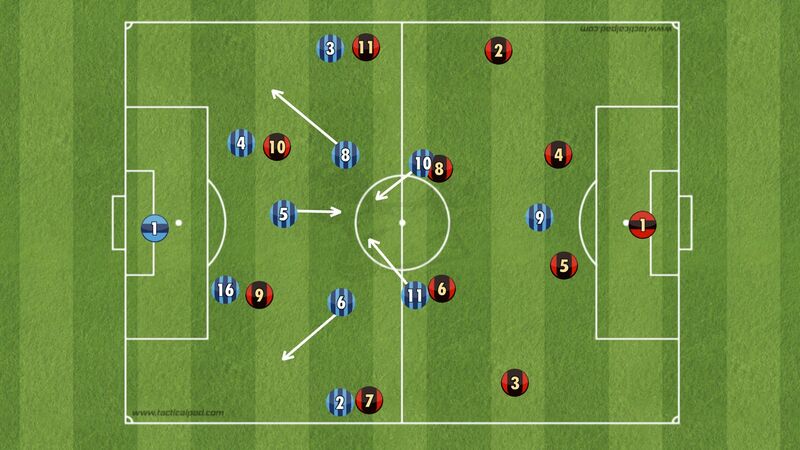 The 3-4-3 is also susceptible to wing overloads like the other three at the back formations. You could even argue that it is easier to create overloads against the 3-4-3 as there are only two defensive midfielders and they are already occupied with the opposition. The inside forwards would not track the opposing full back which can then cause overloads on the wing. The only way to counter this is to keep the ball and push the wing backs high up the pitch which will pin the full backs in their half and prevent them from getting forwards. Three at the back formations can be effective or destructive as illustrated above; it all depends on how you use them. If the opposition are a possession oriented team you could sit back and counter them off the pitch (Chelsea 3- 1 City last season), or they could push you in your own half and you could barely get a touch (Chelsea 0- 1 City) this season. You need to have the right personnel and the players have to be well drilled in their roles for three at the back formations to work, otherwise this formation’s weaknesses can be exploited easily.